Traffic. It’s all about traffic. Right? Well, no. It’s actually all about the list. You see, the only sure-fire way for you to be able to reach your target audience in this day and age is by building a list. The aim of the marketeer is to build that list of prospective and active customers. It is your job as a small business owner to make sure that is happening in your company – right now! Your primary role as a marketeer is to grow your list. Why? Well, because it costs money to advertise and you don’t have control over ensuring your message gets in front of your target audience. Think about it. Wouldn’t you agree there is just so much online (and real-world offline) advertising vying for our attention today? Add to that the fact Facebook and others keep changing their algorithms. This means it gets harder every day to ‘reach’ the right people. So how can you build that list? The best way to build your list is by giving away some of your best and most valuable content and experience. Lots of entrepreneurs will tell you that. No-one expects to give you their email address for free any more. Sure, you might be luck enough to have a recognisable brand already and a ‘tribe’ that people want to be a part of. For most businesses though, to cut through and grab attention, it really is necessary to give away something of value in exchange for contact details. That might be something you normally sell, or it could be something other people have found valuable. I for example, give away a report on how to be responsive in your business. When I produced that content, I received quite a lot of feedback and social shares. Once you have a list, it becomes much easier for you to bring products and services to market. This is because you have an audience that’s already engaged with you and your brand. What’s so great about SumoMe? If you run a website or a blog, and if, like me, you are trying to grow your audience, then you really should be using SumoMe. You may already have heard about SumoMe. If not, you might like to know that almost 200,000 sites out there are using the product today. Trying to grow your audience? You really should be using SumoMe. I tried several of the pop-up tools and plugins. None of them really stuck. Until I started using SumoMe. SumoMe integrates with popular services like MailChimp, Aweber, GetResponse and Constant Contact, etc. How does SumoMe help me grow my audience then? Used together or on their own, they enable you to deliver a branded and ‘smart’ interruption to your site visitors, encouraging them to join your list in exchange for some value. List Builder is used for pop-ups. Scroll Box is ideal on longer pages or posts. Welcome Mat does what it says on the tin and Smart Bar sticks to the top of your site. All the apps come with controls for styling including fonts and colours, so you can blend them into the theme of your site. Also, there are display rule settings and analytics too. But won’t I annoy visitors to my site? Pop-ups and list building tools do sometimes have a ‘Marmite effect’ on people. Some visitors will hate your attempts to gather their details. Let’s face it, if I visit your site and you have something of genuine interest and value to me, I’m likely to be willing to give you my email address to learn more. Also, remember, you can always unsubscribe for the email list later on. In fact, I recommend you do that from time to time. A bit of email housekeeping never hurt anyone. 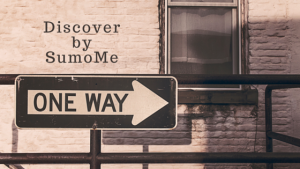 OK but what’s so special about Discover by SumoMe? There are lots of options available in the free version of the tool. You can have up to 24 recommendations laid out in up to four rows. Or if you prefer, you can put one recommendation at a time in a scroll box instead. There are tons of categories and sub-categories of content to choose from. That means you should be able to find a sub-set of others’ sites and content relevant to your audience. You have control of the recommended content that shows up on your site. When people click on Discover articles from your site, you earn credits. Then you use those credits, or rather Discover does, to bring more traffic to your site. So, here’s the thing. If you have a website and you are not currently using SumoMe, go check it out. If you use it already, I encourage you to take Discover by SumoMe for a spin. I have no affiliation with SumoMe. I just love what their suite of apps offers the small business owner and the marketeer. If you are not currently using SumoMe, go check it out. If you find this article useful, please share it. If you like what I write about, please pop your email address in one of the boxes and in exchange I will send you a weekly digest email.